We are thrilled to announce 3 new 6" x 6" stencils from Seth Apter! So excited that we decided to have a Blog Hop to CELEBRATE!!! 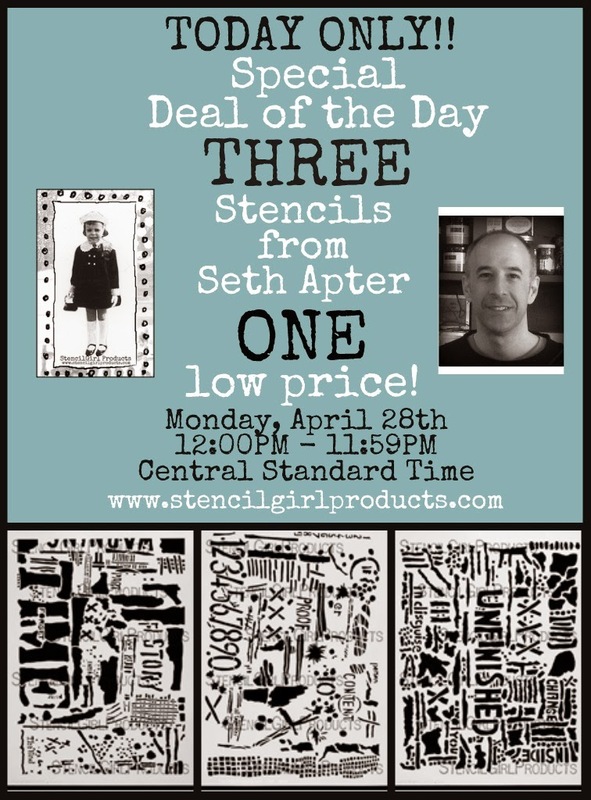 Get all three of Seth's ORIGINAL stencils for one low price! Go HERE to get yours!!! So now that we told you about the celebration! It is time to HOP! Ain't No Ninny and Meme! 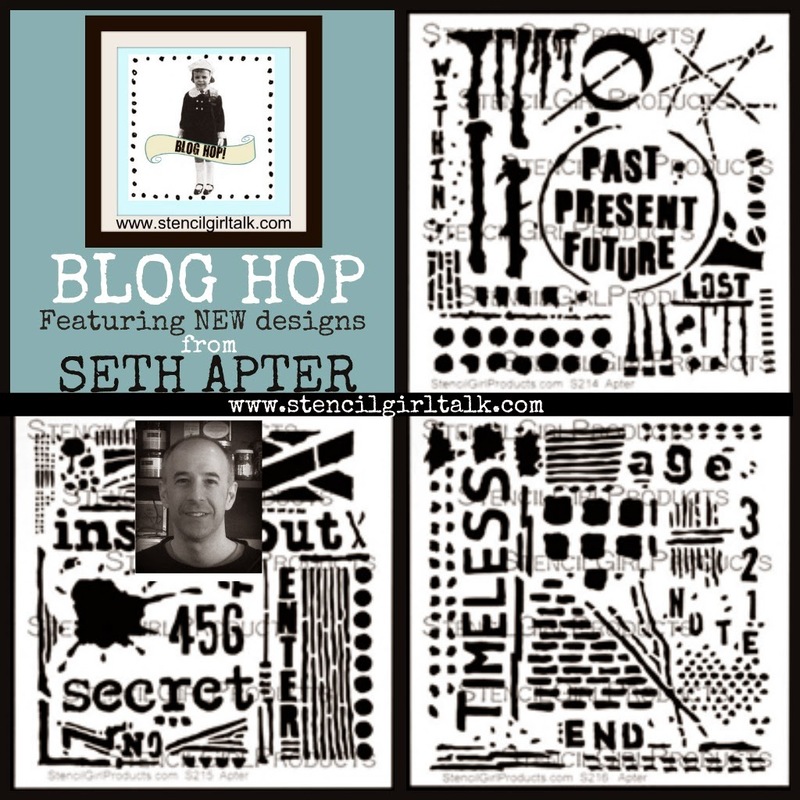 Want to win a set of Seth's new release stencils? TWO lucky winner's will each receive a set of Seth's NEW release stencils!!! All you have to do is leave us a comment below telling Seth how you would use his new stencils! All comment's left throughout the hop are eligible for the drawing--the more blogs you comment on, the more chances you have to be a WINNER! Of course we would LOVE if you would "like" us on Facebook and follow us on Google+, Pinterest and Bloglovin but not required. GIVEAWAY comments will close on Sunday, May 4th at 11:59PM Central Time! Yahoo! Seth Apter stencils! I would so much like to win a set. Versatile stencils, indeed. I would use Seth Apter's new stencils in a plethora of ways: cards, mixed media, flower pots, fabric, walls, etc. Love them all! Marvellous stencils! I would use them in my mixed media pieces, mainly on my canvases! What a great new set of stencils from Seth! Too cool! I LOVE these stencils! I would use them in my scrapbook and with some altered art. They are VERY versatile!!! I absolutely love Seth's stencils.... I see lots of incredible texture with them. If I'm not a blog winner, I know how I'm going to use my coupon!! So many little goodies on each stencil. Great new stencil designs! These would make great backgrounds and accents in my art journal! These stencils look fantastic.....very versatile! These stencils look like so much fun. Count me in! I love stencils! Please, count me in too! I love them! really interesting stencils! Please count me in for a chance to win them! Congratulations on your three brand new stencils, Seth! Love 'me all and plan to use them in my art journal! Arrived here via Linda Cain's blog. What have I been missing??!! Love the stencils. I like using stencils on my cards and mix them up with all my stamps. I love the randomness on each of these new stencils! I see myself using them more than so many that are just one item on the stencil. Who wouldn't love to win a set? I know I would! Thank you for the blog hop and the creation of such neat stencils! Art isn't boring when you have a stencil in hand! I'd use Seth's stencils with gelli plates, for pergamano techniques, and to create all sorts of designs and textures. 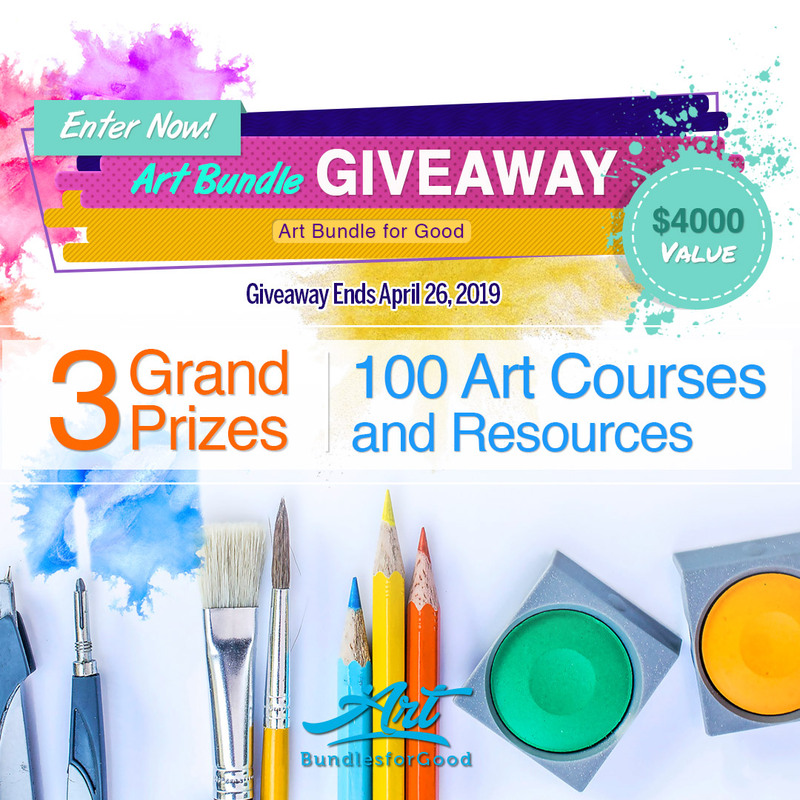 Super great super Great giveaway! Love Seth's work! These blog hops are so fun and inspiring - takes a bit of time, but you each have such great ideas, it's hard to skip one! I like Carolyn's idea of stamping your bill envelopes, but I'd really use them in my mixed media and art journal pages! Would love to use these gorgeous stencils in my art journal! Gorgeous for a journal or card backgrounds! Would LOVE to have these fab stencils! I would most certainly use them in my art journal, but I also love to do mixed media canvas! Thanks for the opportunity! I recently started on art journal and have a few stencils. These would be a great addition to my stash as I do not have any text yet! Awesome stencils! I would love these! Love Seth's art and his stencils are so versatile. As a collage artist I would use them in layers of paint and texture on my work. So excited to see these new stencils from Seth!! I have one of his original stencils and was fortunate enough to be in a class with him last year. Love the new stencils! You were a tease last week but worth the wait! If I win, I'm going to use them in many ways I'm sure, but right off the top of my head I see them being used to make the little addictive books that Michael Trent got me started on last week, I can't stop making them! I LOVE stencils & I sure want those Seth Apter stencils! I'd make greeting cards & so many other things with them. Yup. I would use these stencils in my encaustic paintings. Love that you only use bits and pieces of each. the new stencils are so cool - I would use them on my handmade cards. More good ideas! Like the words,too! Awesome! I like these a lot! If I would win these I'd make my own scrapbook background papers with them! I really hope I win these so I can spend more on the other stencils on my list! Awesome stencils! I would use them for backgrounds on those totally addicting mini books of Michael's that many of us are making like crazy. And for backgrounds on cards. I would use them for everything! Scrapping, card making, mixed media. Wonderful stencils! There are so many great uses for these stencils but I would mainly use them for my canvas art projects! These stencils look fantastic and very versitile! Never can have too many stencils that have words!! I would use them in my art journals with inks and paints. Also to make a cool apron or shirt! 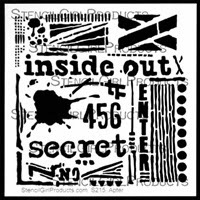 I use stencils on my art journal pages, on cards and scrapbook layouts. I love stencils. So useful to add texture. I could rock these stencils in my journal, my mixed media and would love to use some on clothing! My mixed media art! Looks like fun! I can so so many possibilities with these stencils .....mixed media and artsy cards !! great set !! I can see them helping in creating some really cool backgrounds for my art journal. 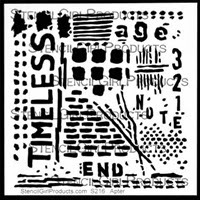 These stencils would be great for Gelli printing! Love multi tasking stencils WOW may I have some.? These stencils have so many cool details! I'd love to win them! I'd love to get one of Seth's stencils so that I can incorporate them into some mixed media art panels I've got in the works! I would love to win a set. I would use Seth's stencils in my art journal and on fabric, maybe clay too. I have one of Seth's first stencils. I'm going to have to get at least one of these, too. I am so hoping that I'll be one of the lucky recipients for these stencils. I think they are amazing. they are identifiable, you can use them on so many different projects, can't say enough about how great they are. thanks for having the hop. The projects always blow you away. I would love to play with these. They look so diverse. All of the Artist had such great works. I really enjoyed this hop, thank you! Such wonderful patterns!!! I would love to use with my new Solarfast paints, acrylics, Dylusions sprays, acrylic spray paints, and maybe some watercolors! I would use with fabrics, papers, and canvas! :) Thanks for the opportunity to win such fun stencils!! 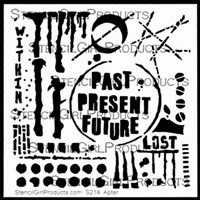 Seth's stencils would be great for monoprinting and creating tags, cards, journal pages...the list goes on! OK, I have a confession to make...when I first heard about this blog hop, I wasn't going to play along as I've never been a big fan of Seth Apter's art. BUT THEN, I saw his stencils! OMG! I love them! Especially "Inside Out" - it's fabulous! Now I have entered on every blog hoping for the chance to win these awesome stencils. Thank you StencilGirl!! I love the variety on each stencil. They are perfect for my mixed media canvases! Such wonderful ideas, where to begin. I love them all. I'd use them in my journalling! I would use them with my Gelli plate. Cards, art journaling, on fabric... Very cool designs. I would love to use these in my art journal and I'm almost getting brave enough to try some canvases. Yay! I love these and would use them to make canvases with lots of texture!! A new cover for another art journal would be in the making! What a great tool for adding details to any project. Thank you for the opportunity to win this! Love Seth Apter stencils & would love to make my own creations with them. Just received my Seth Bundle at the door! Unbelievable service and cannot wait to ink away in my journal tonight!!! I'm in a stencil frame of mind lately; I've been creating art journal pages with my stencils lately. I could really put the words to good use! What would I use them for? Let's see... art journal pages, canvas, wood, gelli prints, t-shirts, aprons, etc., etc,. etc!! Love these!! Seth's stencils are crazy cool! These are wonderful stencils! Thanks so much for highlighting them. Would love to create with them! Yes! These latest stencils that Seth has put together work "together". You can never have to many stencils - the opportunities are endless! Thanks for the opportunity to win these! I have taken two classes with Seth and love his energy and "style". His new stencils are awesome. Thanks for the chance to win them. I cannot decide on a favorite of these stencils. Each one gets ideas spinning off in different directions and each is jam packed. Thanks for the chance to maybe win them. Whoever wins will be very happy! These are fabulous stencils! Wow! So much to work with. Wow, these are great! Lots of little bits that can be used! I have the first group of Seth's stencils and these look like even MORE goodness! Thanks for the chance to win them. Seth's stencils are unique and versatile. I just hopped the entire list of blogs and got some great ideas for the Seth stencils I have and can't wait to get the new ones! These are so cool - would love to use them in art journals and other mixed media projects. Always something brewing. Love the look and feel of these - I think they'd become favorites! Let me try this again - can't seem to get the right login: These are so cool - would love to use them in art journals and other mixed media projects. Always something brewing. Love the look and feel of these - I think they'd become favorites! Great hop! Got through all of the blogs and there are so many different ideas. I love how versatile these stencils are. I think I could use them for so many different things. Thank you for sharing.